Roll the pom pom between your hands to return it to its fullest roundest shape. 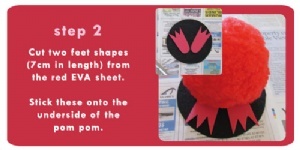 Cut a circle from the black felt or EVA about 11 - 12cm in circumference. Cut out some feet shapes from the red EVA, about 6cm in length. 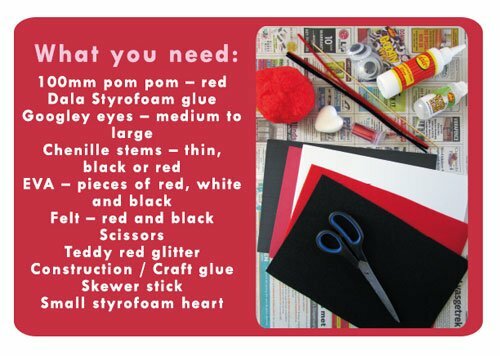 Using the Styrofoam glue, stick these feet onto the underside of the pom pom. Position them how you like before they dry. 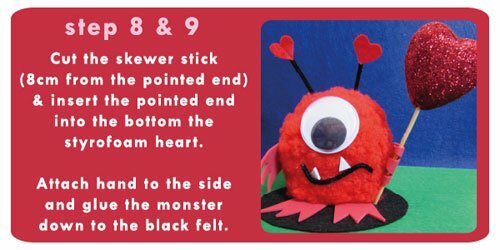 Create some antennae for your monster by cutting two small lengths (5cm) of black or red chenille stems and then some small heart shapes from the red felt of EVA sheets. Push the pieces of chenille stem into the pom pom (about 1 or 2cm deep), with a bit of styrofoam glue on the end to secure it. 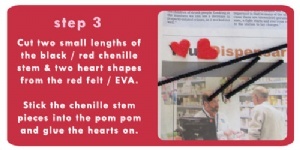 Then glue your felt / EVA hearts onto the antennae tops. 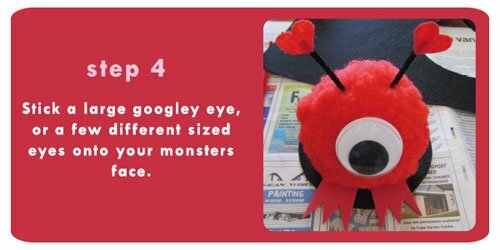 Choose an eye size and glue the googley eye onto the front of the pom pom. You could use two smaller ones instead or one very big one. We used a 40mm eye for this tutorial. 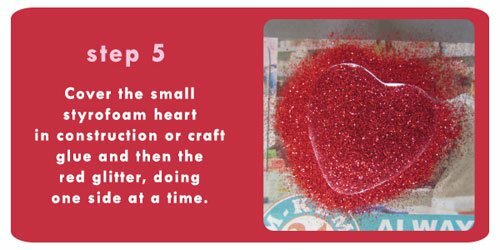 While all your monsters eyes and antennae are drying, coat the styrofoam heart in Construction Or Craft glue and then the red glitter, doing one side at a time. The glue should take about 15 minutes to dry. 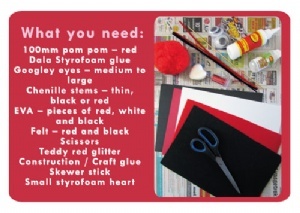 While you are waiting for the glue and glitter on the heart to dry - create your monsters hands / arms. These resemble the monsters feet but are smaller and squatter. Glue one arm on (ie the arm not holding the heart) to the monsters body. The other hand will be used in step 8 - 9. 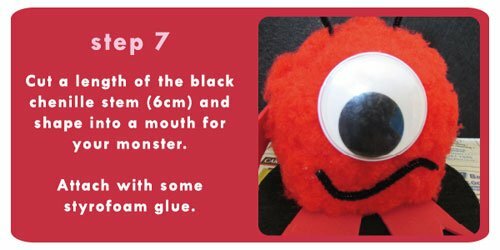 Cut and bend a small length of black chenille stem to create an interesting mouth for your monster. From the white EVA - cut some teeth shapes - they can be round, square or sharp as in the tutorial. 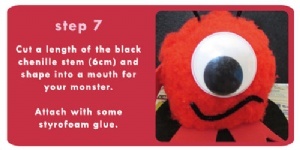 Position them as you would like and then glue them onto your monsters face. Cut some teeth shapes from the white EVA sheet and glue into position. Cut the skewer stick about 8cm down from the pointed end. 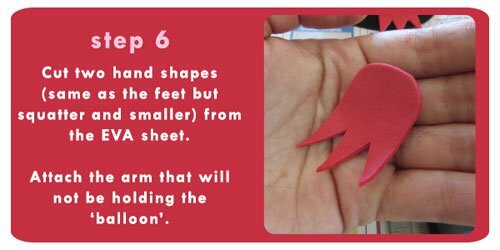 Place the skewer stick on the unused EVA hand from step 6 and use some Styrofoam glue to stick the fingers down around the stick - hold it down for a little while. Wait about 10 minutes for this to dry. 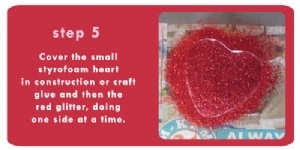 When the glitter and glue on the styrofoam heart are dry, insert the pointed end of the skewer stick into the centre of the bottom of the heart. 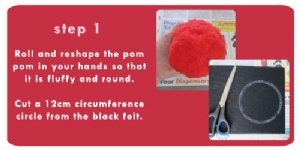 Then glue the hand, holding the stick to the side of the pom pom. Hold it and press gently to reinforce the glue. 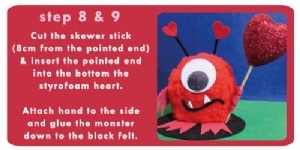 Lastly, glue the entire monster down onto the black felt circle and wait for about 15 minutes to dry. 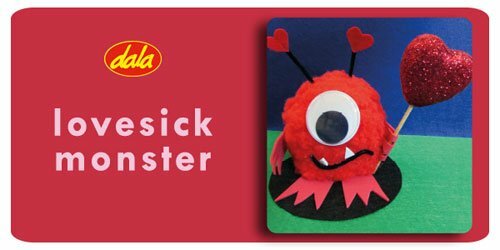 Your monster is ready to surprise your valentine! This item has 869 views.